Fantastic! No need to be a Crows or Port fan to appreciate this stadium. 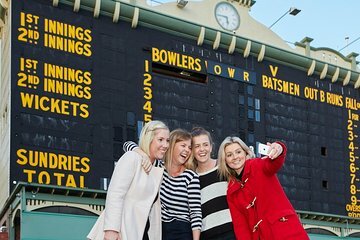 Your tour guide takes you around the entire oval, including change rooms and inside the early 1900s scoreboard. Good value for the 1.45mins our tour took. Highly recommend this tour. Great value and very informative tour showing all aspects of the Stadium. A pleasant tour for the family, even my 6 year old. The guide had lots of knowledge and it was exciting to go into areas we normally don't have access to. The scoreboard was especially cool. Due to the timing, sad we couldn't go into the dressing room or onto the actual oval even if just for a photo. Worth a look for cricket fans!! its a great tour and there is a lot to see at the stadium. Fantastic experience to be able to see behind the scenes of one of the best in Australia! Couple it with the Rooftop Climb and you will have a day to remember! Great tour and very informative guide. Lovely ground and great museum. Amazing tour and can highly recommend. It gives you a behind the scenes feel of the running of the oval. Guide was extremely knowledgeable. I was the only one on the tour- still did it. The guide was very knowledge on all aspects of the ground- both in cricket and AFL . The change rooms were interesting to see as you usually don't see in these rooms. Fantastic...highly recommend this tour. Our tour guide was very informative and had a great personality. It was awe inspiring to view every aspect of the oval. We just loved the old score box with its workings and history.